Shenandoah National Park lies astride part of the Blue Ridge Mountains, which form the southeastern range of the greater Appalachian Mountains in Virginia. 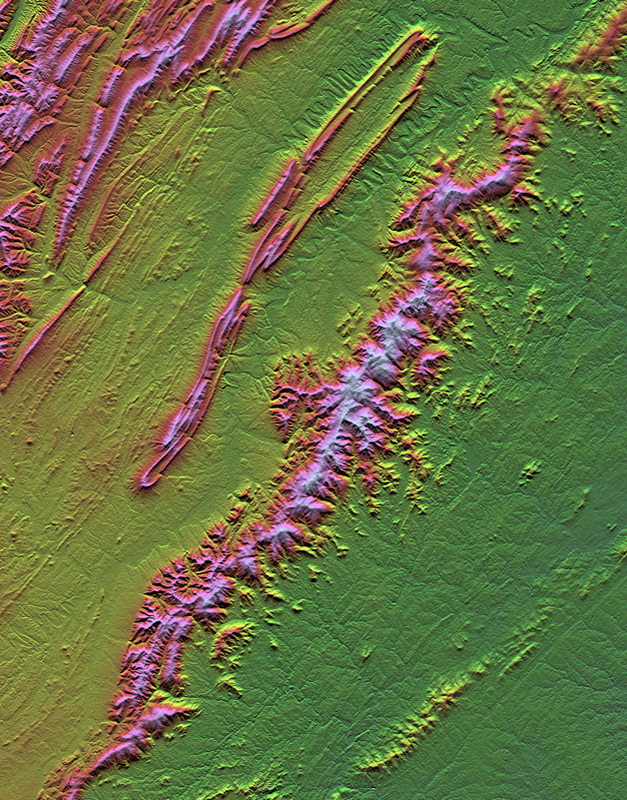 The park is well framed by this one-degree of latitude (38-39 north) by one-degree of longitude (78-79 west) cell of Shuttle Radar Topography Mission data, and it appears here as the most prominent ridge trending diagonally across the scene. Skyline Drive, a 169-kilometer (105-mile) road that winds along the crest of the mountains through the length of the park, provides vistas of the surrounding landscape. The Shenandoah River flows through the valley to the west, with Massanutten Mountain standing between the river’s north and south forks. Unusually pronounced meanders of both river forks are very evident near the top center of this scene. Massanutten Mountain itself is an unusually distinctive landform also, consisting of highly elongated looping folds of sedimentary rock. The rolling Piedmont country lies to the southeast of the park, with Charlottesville located at the bottom center of the scene. 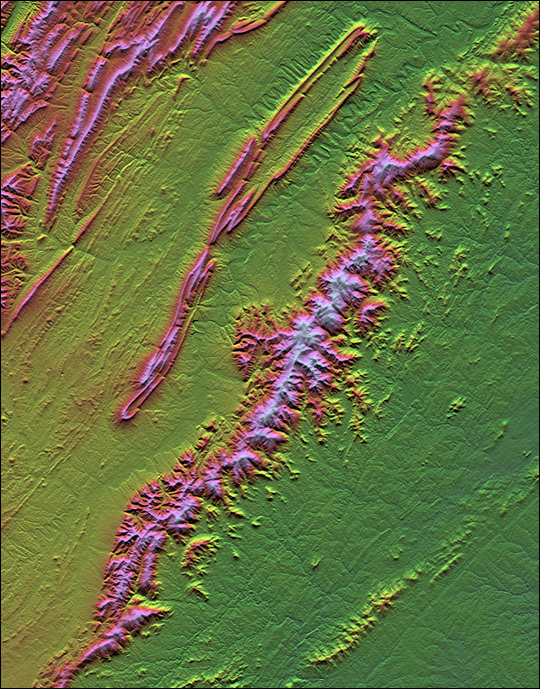 Elevation data used in this image were acquired by the Shuttle Radar Topography Mission aboard the Space Shuttle Endeavour, launched on February 11, 2000. The mission used the same radar instrument that comprised the Spaceborne Imaging Radar-C/X-Band Synthetic Aperture Radar that flew twice on the Space Shuttle Endeavour in 1994. The Shuttle Radar Topography Mission was designed to collect three-dimensional measurements of the Earth’s surface. To collect the 3-D data, engineers added a 60-meter-long (200-foot) mast, installed additional C-band and X-band antennas, and improved tracking and navigation devices. The mission is a cooperative project between NASA, the National Imagery and Mapping Agency of the U.S. Department of Defense, and the German and Italian space agencies. It is managed by NASA’s Jet Propulsion Laboratory, Pasadena, Calif., for NASA’s Earth Science Enterprise, Washington, DC.